The Simsfiles links aren't working, weird. Delete the www. part of the url and it should work fine. 140.3 of WW seems to not allow Teens anymore. Anyone know how to fix it? I tried toggling it but it still won't have them appear in the menu only young adult-elder. Anarcis Caught Naked series 16 variants 2p and 3p for floors. Hey Manta! Thanks for the upload! Could you, please, upload the Platinum Azmodan update? Thank you so much!! Sure , I was working on that next. Most maintenance / upgrades have been completed, so the site should be open to all, but all the new features have shown some bottlenecks that cause slow loading. We are sorry, we are working on it, and we will keep you informed! I get an error with too many redirects when I try to load that link. I've cleared cookies twice, tried 3 different browsers, including one that I have set to accept every one. Any ideas? These links don't appear to be working at all. I got the chance to download them before SFS gone down, still trying to get sstormyy and dumbaby stuff thought. 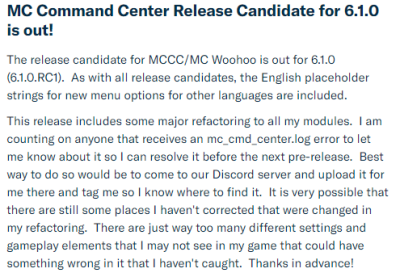 MCC and MCWoohoo versions shared by Mandy are now on the Mega Folder. SimFileShare won't let me upload right now, so using MEGA above. First time, please let me know if anything isn't working properly.